There are few things more devastating to a woman than losing her hair. Whether you’ve watched it fall out in clumps or noticed a gradual thinning, the whole experience can be stressful and emotionally traumatizing. Compounding the problem is that many products that claim to treat hair loss have side effects, show only modest improvement (if any), are expensive and require permanent use of the product to work – the minute you stop using it, you’ll start losing your hair all over again. So when I noticed my own hair thinning, I did some research and looked into Ayurvedic remedies that were tried and true. That’s how I found out about fenugreek seeds (aka “methi” seeds), which is a common spice you’ll find in many Indian grocery stores. Turns out fenugreek has been used for centuries as a traditional remedy for hair loss, plus it’s known to make hair grow thick and shiny. And when I gave it a try… I was shocked to discover after about a month that my hair was shedding less and… getting thicker! 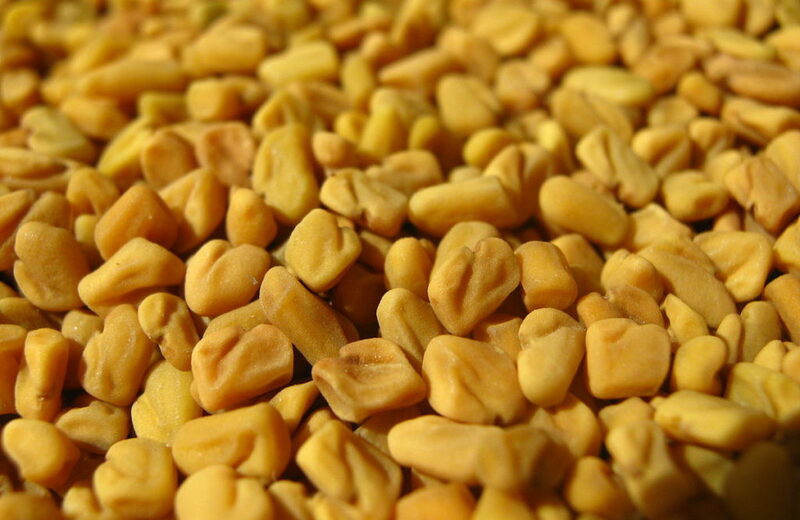 Fenugreek seeds are very high in protein which fights baldness and nicotinic acid, which stimulates hair growth. It’s also rich in Vitamin C which boosts you immunity, iron for blood circulation and potassium which fights grey hair. Fenugreek also contains large amounts of lecithin, which moisturizes hair and strengthens it from the roots and hair follicles. The lecithin is also known to bring back shine and luster to dull, damaged and dry hair… like who doesn’t want that? Leave the seeds in the same water and grind them into a past. This will make the water slimy, but the slime is what gives your hair shine! Then refrigerate. Note: You can add a few drops of peppermint and rosemary essential oils to the paste. I’ve also added a whole scotch bonnet pepper (you can use any super hot pepper) to the paste. The heat from the pepper will make the fenugreek seeds work even better. I used to apply the paste as a leave-on conditioner, but the smell was a bit too much. When I switched to doing a washout conditioner, it worked just as well and without the curry smell. If you’ve tried this and have any cool modifications to preparing this, just comment below to share your remedy.